A similar article first appeared in the Florida Newsline publications on September 29, 2017 at the link below. Edison and Ford in Florida sign. I’ve lived in Florida since 1997, but a certain light bulb never went off in my head until recently. 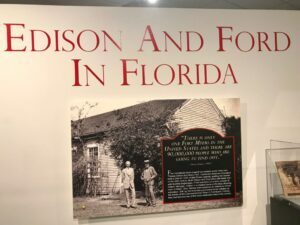 I’m a travel writer, yet I never visited one of Florida’s most noteworthy historical landmarks: the Edison & Ford Winter Estates in Fort Myers. I revved up my motor and headed down to Fort Myers. The winter homes of the two titans of American industry sit side-by-side on 20 acres of lush botanical gardens bordering the Caloosahatchee River. The property straddles McGregor Boulevard, a street lined with tall palms. Edison planted more than 2,000 Royal Palm trees along McGregor Boulevard, offering to maintain them for two years if the city would care for them thereafter. Today, Fort Myers, “City of Palms,” boasts hundreds of the trees more than 75 feet in height. A walk from the parking lot to the entrance winds past an amazing Banyan tree, planted by Edison around 1925. That four-foot tree now covers almost an acre of the grounds. Thomas Alva Edison (1847 – 1931) is considered one of America’s greatest inventors. He developed many devices that became part of everyday life, such as the phonograph, a motion picture camera, and of course, the electric light bulb. Dubbed “The Wizard of Menlo Park,” Edison holds 1,093 US patents including a stock ticker, a mechanical vote counter, a battery for an electric car, and recorded music. He developed a system of electric-power generation and distribution allowing homes, businesses, and factories to enter the age of industrialization. Manhattan, N.Y. became the site of the Edison Illuminating Company’s first power station. As a young man, Henry Ford worked for Edison, who encouraged the young engineer’s ideas. Ford later became the founder of the Ford Motor Company, revolutionizing transportation by making affordable cars widely available. Although Edison was 20 years his senior, the two became good friends. Ford made trips to Florida to visit his mentor, eventually buying the house next door. Guided tours of the property are rich in information about the two and about the research that interested both — like tires for example. The tour includes a peek inside Edison’s home, guesthouse, the Ford home, and other outbuildings. A knowledgeable guide offered memorable stories about the lives of Edison and Ford families and their friendships. 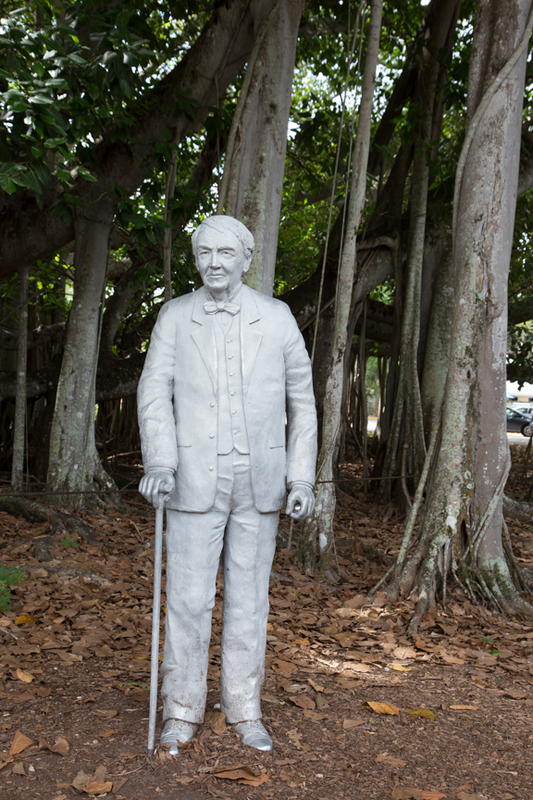 The guide explained that Edison arrived in Fort Myers in 1885 and decided to purchase the property. At the time, Fort Myers was virtually inaccessible by land. The few visitors who arrived came by boat from the Gulf of Mexico and then up the Caloosahatchee. When widower Edison married Mina in 1886, Fort Myers became their honeymoon haven and winter home. 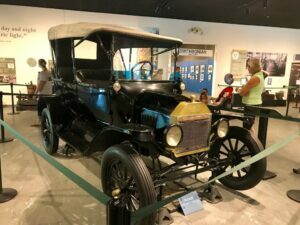 Early Ford auto in the museum. The museum houses many interesting artifacts developed by Edison and Ford. Visiting auto enthusiasts will find the displays of old Ford cars satisfying. Those wishing to spend a full day at the Ford & Edison Winter Estates can stroll to the marina and board a newly built passenger vessel for a cruise on the Caloosahatchee River. The boat trip includes certified naturalists or historians from Pure Florida and the Edison Ford Estates. Fort Myers is located in Southwest Florida. A weekend getaway can include a night on nearby Sanibel Island or some time exploring Sarasota, St. Petersburg or Tampa along the Gulf Coast.